Ricardo Almeida, also known as Cachorrão was one of the top mixed martial arts (MMA) fighters throughout the 2000’s era, in the welterweight and middleweight divisions, competing in promotions such as the Ultimate Fighting Championship (UFC). This UFC veteran is also an accomplished black belt in Brazilian Jiu-Jitsu (BJJ) under the legendary Renzo Gracie, having medaled in some of the most important grappling tournaments in the world such as the ADCC (Abu Dabhi Combat Club), Brazilian Nationals and the Pan American. Almeida retired from MMA early in 2011 to dedicate more time to his family. Nickname: “Cachorrao” means “Big Dog” in Portuguese. The name came about before Ricardo he started training jiu jitsu. An avid Surfer, Ricardo Almeida had the reputation of kicking people out of the sea and being very protective of his surfing spot, because of this the local beach lifeguards gave him the name “Cachorrão”, the name of a famous soap opera “bad guy”. Ricardo Almeida was born on the 29th of November 1976 in Weehawken, New Jersey (USA). Although he was the son of Brazilian immigrants in the US, who moved back to Brazil shortly after Ricardo was born. As such he spent most of his childhood and adolescence in Rio de Janeiro. 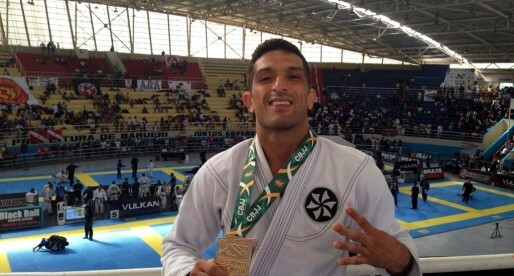 Almeida started training BJJ when he was 17 years old after a surfing friend invited him to come and train at Gracie Barra in Rio de Janeiro. 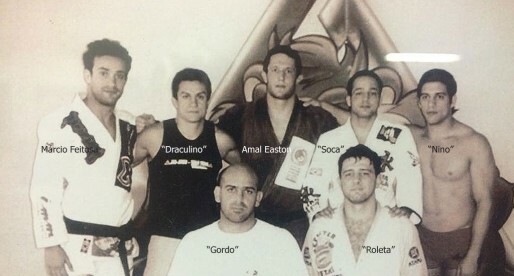 Training at Barra Gracie, Almeida became good friends with Renzo Gracie, with whom he moved to New York to help establish Renzo’s school there. Ricardo was awarded his black belt by the Gracie shortly after arriving in the US, becoming Renzo Gracie’s very first black belt. MMA appeared in Almeida’s life career by chance. When he was in Japan cornering Ryan Gracie and one fighter on the event pulled out due to injury, Ricardo was offered the chance to fight Akira Shoji, who was already a “made” fighter back then. Ricardo accepted the challenge took the fight, winning it by decision on December 2000. On November 30, 2003, Almeida was involved in an altercation with middleweight opponent Nate Marquardt in a Pancrase title fight. Marquardt was put into a guillotine choke and tapped, Almeida did not disengage and the referee was unable to immediately separate the fighters. After the choke was let go, Marquardt threw a strike at Almeida’s face, prompting both corners to storm into the ring – including Renzo Gracie, who was cornering Almeida and kicked Marquardt in the face. The confrontation came to an end, and Marquardt approached Almeida after the bout to congratulate him. In 2004, in the prime of his career, Ricardo Almeida vacated his Pancrase title. He had competed in the top MMA promotions at the time (Pride FC, UFC and Pancrase) but decided to pull out and dedicate himself to his BJJ schools and his family. He stated that he was fighting too often in Japan and losing time to see his newborn baby grow. In 2008 Cachorrao returned to the UFC this time to compete as a welterweight. He was accustomed to fighting in the middleweight division though an injury suffered in the back impaired him from working with weight lifting, which caused his natural weight to drop substantially. After a loss suffered to Mike Pyle at UFC 128 (by decision) on March 2011, Ricardo Almeida decided to retire for the second time in his career, stating that he could not focus 100 percent on fighting as he wanted to dedicate more time to his family, as his son was diagnosed with autism.